Had to share this one - a really cute story. We staged a press launch and photocall last week at the Mab Lane Community Woodland for the Mersey Forest and Forestry Commission. 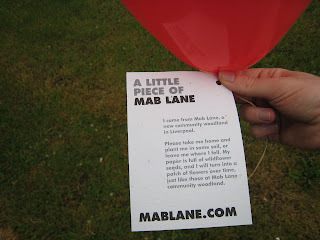 My colleagues were there at the break of dawn, inflating (biodegradable) balloons with tags attached full of wildflower seeds. 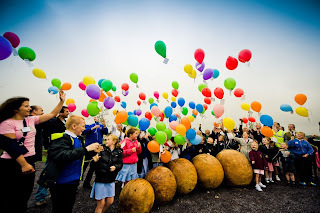 It was the one and only rainy morning of the week, predictably, but even so more than 30 children from St Brigids, St Albert’s RC and Mab Lane Primary School released the biodegradable balloons filled with wild flower seeds into the air to help plant vibrant patches of wild flowers right across the region and beyond. "I’m a teacher at Highfield Hall Primary School in Chesterfield, Derbyshire. One of the Nursey children I was teaching bought a big bunch of colourful balloons in, having found them on her way to school. The children are going to be planting them on Monday. The Nursery children were very excited and interseted in the story behind the balloons and can’t wait to plant the seeds. What a lovely idea!!" So our balloons flew up into a soggy sky and made it 66 miles at least. Totally lovely. 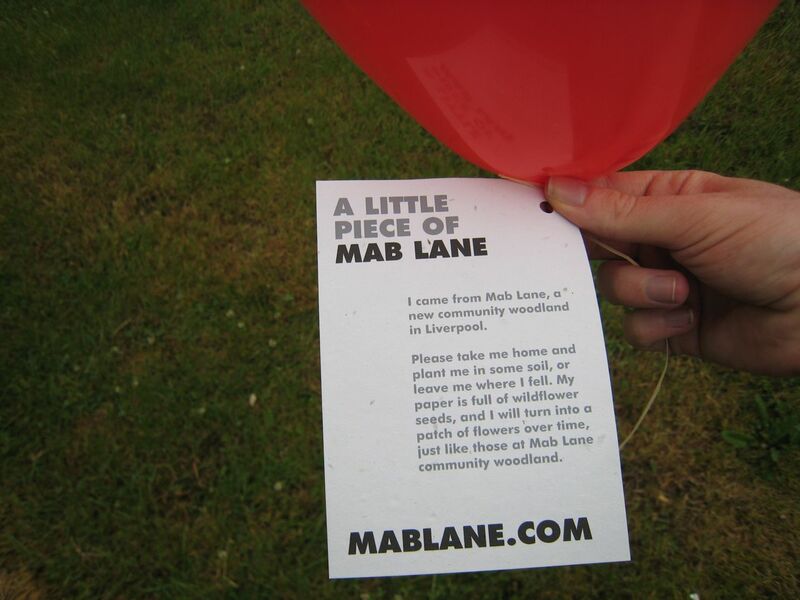 The event was staged to mark the completion of the planting of 20,000 new trees to create the Mab Lane Community Woodland on two former brown field sites in West Derby as part of The Mersey Forest.